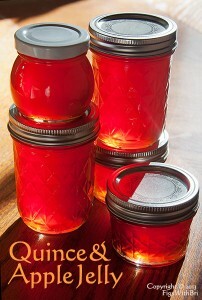 Blue Ribbon Preserves: Quince Crab Apple Jelly ~ Wins 1st Place TWICE! ~ An old-fashioned farmstead staple that brings back memories to an older generation who remember this flavor with fondness. The perfect unusual gift for the gourmand in your life. Quince crab apple jelly, like quince paste would make an excellent complement to a holiday cheese platter or as a cream cheese topping on crackers. This flavorful jelly, warmed and thinned with a touch of apple cider, would be nice drizzled over simple cakes or ice cream. For those of you who eat meat, it might also be very interesting with certain meats…pork or fowl? INGREDIENTS: Organic Quince, No-spray Pink Crabapples, Organic Cane Sugar, Filered Water, Meyer Lemon Juice (for pectin) & Love. Trudy, my mother-in-law, selected a jar of our Quince Crabapple Jelly yesterday as a reminder of her childhood in Germany, where quince are used quite commonly. She said Quince Jelly can’t be found in American grocery stores. How true.